Wouldn’t it be nice if you could grow a spectacular garden in your backyard without all the hard work? Gardening shouldn’t be stressful; it should be relaxing and healthy. Here are 5 ways you can enjoy gardening without the hard work. Enjoy gardening? Maybe you like to grow your own food, or maybe you want to turn your backyard into a beautiful heaven, no matter what your goals are, gardening should be pleasant and peaceful, not stressful. So how do you avoid all the back breaking hard work? Here are five ways to maximize your benefits from your garden without all the hard work. “Picardo Oct 03” by Joe Mabel. Licensed under CC BY-SA 3.0 via Commons. Raised beds are excellent for growing plants, especially if you are growing heat loving plans such as chilies, eggplants, or sweet peppers. 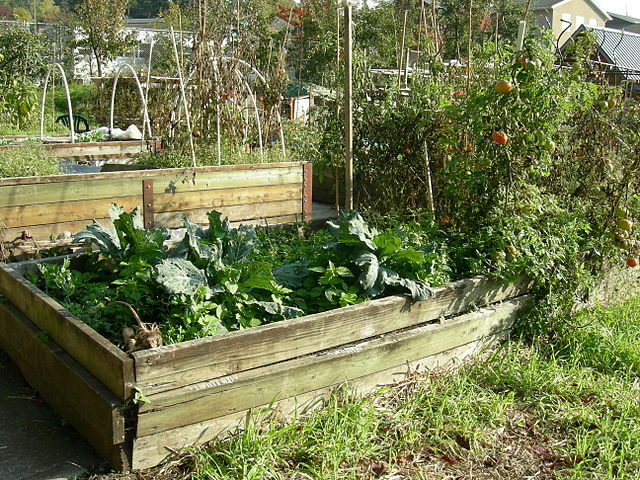 There are several advantages of using a raised bed for gardening. You are able to use high quality top soil. You have more control over your garden. 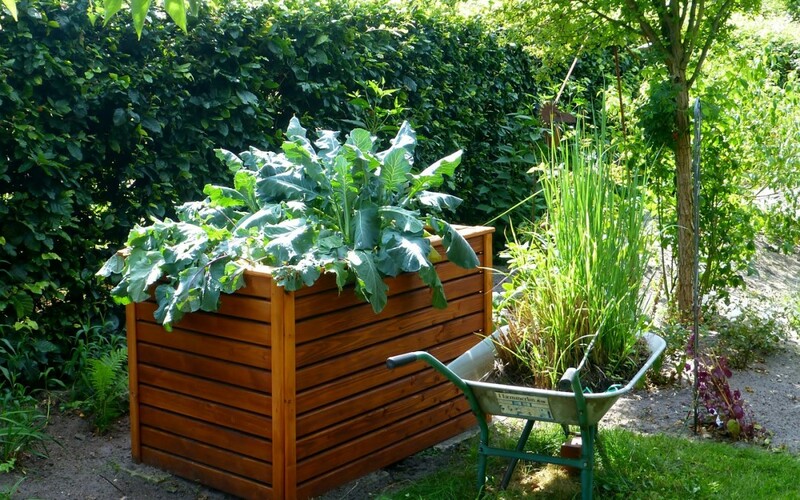 You can make beautiful designs with raised beds. A lot easier on your back and knees. In a “no-till” system, the soil is never disturbed, and the soil retains its natural complex subsoil environment which can be very beneficial. Instead of tilling your soil, you just have to add natural organic fertilizers, peat, compost, manure, to the topsoil. Overtime, all the nutrients from the topsoil will eventually get mixed with the subsoil. Make sure to water your garden regularly. You can save plenty of hard work if you avoid dragging your hose from bed to bed. It’s not recommended to set sprinklers and leave because it can be damaging to some plants if water collects on leaves; such as tomatoes which suffer from blight when too much moisture collects on their leaves. “Today, we simply turn on the water spigot and each bed receives a slow, steady flow of water directly to the root zones. Soaker hoses are laid on beds, delivering slow, steady dripping to the plant root zones. This saves us time, and also saves water since no spray is lost to wind, and our pathways do not get watered. This is important because pathway weeds will dry up and require less work in weeding. Less work!” – Greg Seaman, Eartheasy.com. Some plants can increase the fertility of your soil by converting free nitrogen from air into nitrates. Growing some leguminous plants in between crop rotation cycles will retain and enhance soil nutrients. “By planting green manure cover crops, such as peas, vetch, rye or buckwheat, between crop rotations, we don’t have to purchase and haul heavy bags of peat moss as often” says Greg Seaman, Eartheasy.com. “Hochbeet Vordermühle 1” by B. Blechmann – vom Autor. Licensed under CC BY-SA 3.0 via Commons. Adding mulch to your topsoil is an excellent way to keep your soil moist. Mulch controls weeds, retains moisture, prevents soil erosion, and encourages earthworms to move in and till your soil naturally. Overtime, mulch will break down and add to the soil health and nutrition. Overall, adding mulch will help you maintain a healthy natural environment for your plants. 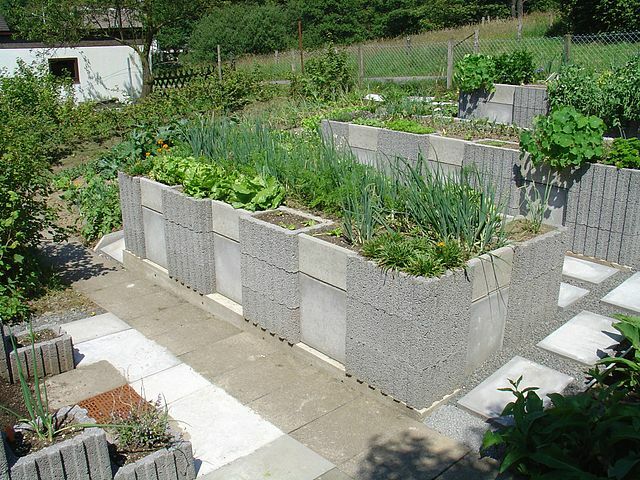 Hope you will enjoy growing seasonal fruits and vegetables in your own backyard garden. With these techniques, growing a healthy garden will become so much easier that you will be motivated to spend more time in your garden. Enjoy your garden to the fullest, without all the hard work! Would you like to know how to grow plants from cuttings using a cutting globe? Want to grow plants in an aquaponic tower garden? Want to obtain a smart Aquaponic Tower Garden®? 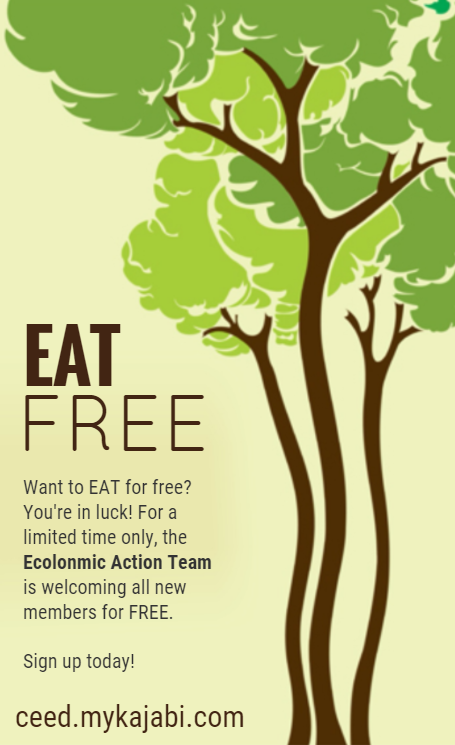 For more information on urban agriculture, call us at 303-495-3705 or Click Here to book a meeting with us. We’d love to hear from you, so please add your comments in the comment box below or visit our Facebook page.